This look is so perfect for transitioning into Spring. I’m still wearing my neutral closed toe flats and I’ve been wearing my white denim for a while now. This top though, screams springtime! Starting from the color, to the cut of the top, all the way to the cute cut-out detailing on the sleeves. You know that feeling when you go shopping and leave without buying something that you knew you had to have? That was this top for me. I laid my eyes on it once, but I left the mall without it. So, on my next shopping trip this top was all I could think about. It’s so fun and flirty and I can’t wait to wear it on repeat all spring and summer long! 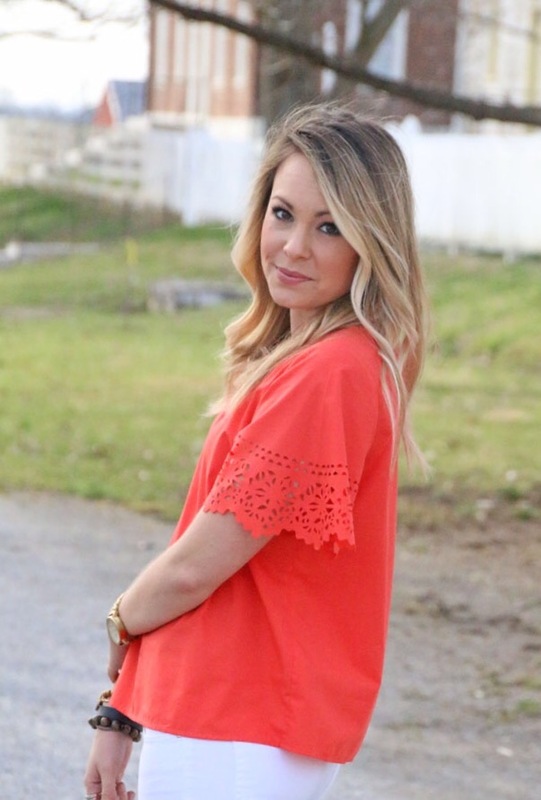 I decided to pair this top with my white jeans because I feel like it gives the coral that extra POP it needs to really stand out. Because of this I didn’t really want to accessorize too much. I think this top makes a statement all by itself, it doesn’t need extra pieces to help it.